Pedro Almodóvar. Produced by Agustín Almodóvar, Pedro Almodóvar, Esther García, Written by Pedro Almodóvar. Spanish with subtitles. Cast. Emma Suárez as Julieta, Adriana Ugarte as younger Julieta, Daniel Grao as Xoan, Inma Cuesta as Ava, Michelle Jenner as Beatriz, Darío Grandinetti as Lorenzo, Rossy de Palma as Marian, Susi Sánchez as Sara (Julieta’s mother), Pilar Castro as Claudia (Beatriz’s mother), Joaquín Notario as Samuel (Julieta’s father), Nathalie Poza as Juana, Mariam Bachir as Sanáa, Blanca Parés as Antía (18 years old), Priscilla Delgado as Antía (adolescent), Sara Jiménez as Beatriz (adolescent). The cast list gives you an idea of the flashback construct of the story which is Julieta telling us of her life, as Xoan (Daniel Grao) who she meets on a train journey as a young woman, conceive Antiá. A chance meeting in the present day, in Madrid with Beatriz (Michelle Jenner) who is a friend of her long estranged daughter informs her of Antía’s life, which is now in Switzerland and of her having three children of her own. Instead of following through with plans to move out of Madrid with present partner Lorenzo to Portugal she decides to once again retreat into a past where in Madrid Antía was raised; she acquires an apartment at their old home and sets about addressing the absence once again and how it came about. Pedro Almodóvar’s construct is to write a letter – the film Julieta in which he has two actresses playing the principal constructs new territory for his portrayal of women having developed a character split between the two actresses – Adriana Ugarte as the young (memory) and Emma Suárez as the present, aspects of the same person woven together. Ambiguous as the shift would seem, Pedro Almodóvar has left things, unknowns, uncertainties, to rest in the frame work of the story leaving no easy compromising junction. No juxtaposition of emotional recognition is fashioned for easy access and acceptance. He has left it for Julieta to unravel the story to explain the degrees of separation, the bonds and conflicts which have her driven to seek answers which over time have remained absent. This driven emotion is a daughter mother narrative in which the words have yet to be found to explain from both, the estrangement. In the letter we have only one part and it is played by two versions of the same person. The young beautiful Julieta, finding love, a new existence away from her parents whose own life is very deftly woven into the story. Important pieces of the jigsaw are explained in transit, in car journeys from arrival to destination, in the train journey, in the void of a lone journey, shaping the links and bonds of location. Never are you uncertain where the story is, given the finite craft of the storyteller. In fact it is crucial as each set of circumstances tells its own solid slice of story with some elements being as cutting to the core as a knife. Julieta’s backstory is principally acted by Adriana Ugarte in her entry to motherhood and the relationship with an Andalusian fisherman who has his own problems and complex relationships. He lives in a sea front house which is cared for by an elderly woman, Marian (Rossy de Palma) who is very protective of her role and sees herself as a moral guide to Xoen who has duties elsewhere while she attends to the domestic tasks of cleaning and cooking. There is also a very good friend of Xoen who is a sculptress and her presence and art create elements of friction, tension. Julieta is intrigued by this woman and maybe sees some creative world as a part of her. They never share the experience but converse and talk about the work Ava creates. There is in this flashback which virtually contains the whole form of Julieta’s life exposing her coruscating challenges as we venture into her own family background, her frail mother and father whose career shift from teacher to small holder informs the tapestry Pedro Almodóvar wishes to present in delivering a full formed portrait of the perplexing narrative as Julieta places her life story to paper. She jettisons a fledgling robust relationship to reconnect with her daughter. Antiá has been estranged for twelve years. The estrangement is itself a twin peaked result neither Julieta and Antiá are fully certain of the truth and origin. In this his 20th film he is less insular and is compellingly thought provoking with once more the psycology of the human, (one film I recall The Skin I live in, involved dissection of a human in a medical room with transference a plot pivot.) taking over in the spaces between the images; image being less manipulative to contrive an absolute. Here he is almost allowing the viewers to make up their own mind. He is less manipulative so gaining maturity in expanding the freedoms stories and cinema telling them the expanse his work beautifully opens up. So far from the stimulus of the object, flower, face, pudenda, the effect is – and his cast give full license to the imagination especially the two halves of the same – Adriana Ugarte and Emma Suárez from opposite positions in the same life, inhabit this letter as neither recollection or reconciliation, rather more a recovery excercise which will reveal for Antía a framework to reassemble her memory of her mother. How the letter will reach her is another mystery. For Julieta her former self is a shocking journey of revelations she has to confront as the letter is formed. Beatriz (Michelle Jenner) is the only link. Their encounters happen in Madrid while Julieta (Emma Suárez) is shaping the letter. Bea is a key figure in Antía’s life and Julieta has spent time with both of them when they meet at summer camp. 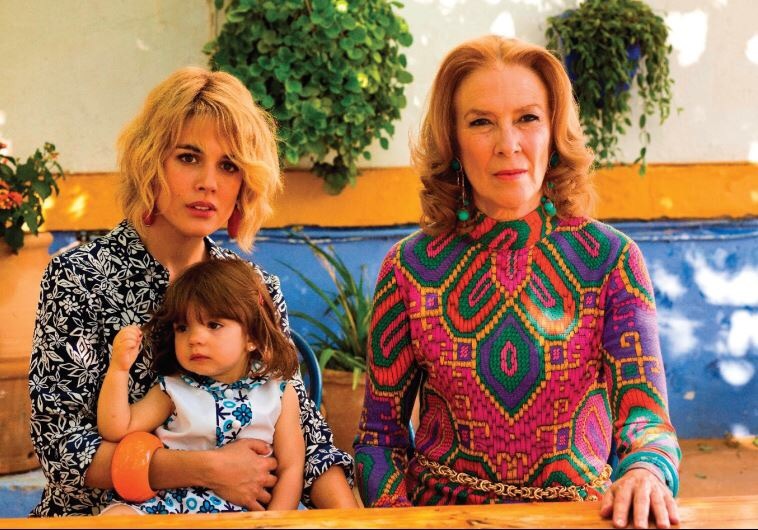 Pedro Almodóvar has chosen to avoid melodrama, expressly saying its a no tears zone in the world of Julieta. Remorseless at it may seem, it then gives license for the arc of containing tension, to going on a journey with Julieta. The lightening fast immersion of his films, a shot can transform the outlook, is still a force of his style. The uncomfortable task of location shooting is also something he has chosen to accept on top of recovery from a back operation, as it once was his (during wrapping up The Skin I Live in, ) ambition to shot the film in Alice Munro’s Canada authentically placing it however it was not a place he understood (he called it wide, depressing) so parked it until a suitable idea and reconstruction of the script, now quite detached from the Alice Munro stories thought essentially containing the reberances of the emotional passage. Locations thus became parts in Madrid in real houses, also in Galicia, the Pyrenees, Andalusia. Then the key element he confesses to a cine journalist who interviewed him with the following revealed. “Film is my whole life. Which in some way condemns me. If I am not involved in a film, my life feels sad.” Pedro Almodóvar. He is very much a person who is passionate about every piece of work, as it comes fully formed after many diversions, revisits, examinations and hours upon hours of assembly in his mind. From its concept within his current perception – we travel with him and like the film, it is itself a viewpoint informed by looking back – of seeing the accumulation, the editorial processes he uses, including as prompts and inspiration wallpaper as opposed to deep pile narcissiccm, filling the walls of his Las Ventas, Madrid office the many portraits of fellow directors and actors from Penelope Cruz, through Billy Wilder to Jeanne Moreau. Or so the interviewer recounts. A natural history of the art of Cinema plotting his tutorial with his contribution now totally in the frame with this again defining the role cinema can enhance our understanding and our lives. How he has turned this film into a non crying drama is itself an act of bravado. Behind many of the characters there are tears being formed in molecular detail. In Julieta herself former and now we see the virtual composition of tears without them flowing. This is a dramatic push into the viewers reactions, the hurt being lessened (for Julieta if we engage with it) by our acceptance of the emotional necessity of release which is on the threshold always. It is a very present strain we encounter which Emma Suárez delivers across the film gate staggeringly convincingly. The constructs of her writing phases are likewise measured and choregraphed with intensity. Beautifully told as they depict release for Julieta while at the same time not being a resolution without the receipient knowing the content. This film is an astounding contemporary incisive examination of the release of uncertain truths and how having only your own elements of a story to rely on point to the fragility of even the most intense and close relationships. Emma Suárez is the Cloepatras needle firmly placed in a reality with ever changing reference points. She seeks stability through reason, rationality and truthfulness. She is an honest woman whose life has enhanced and fed parts of others life’s while she is often sidelined by actions outside her control or knowledge. Her coping strategy has been to banish the bad elements, the unanswerable elements of the past by reinventing herself and surroundings. The younger self in flashback, in the letter, is dropped into a love from a great height in a new environment. All the while the presence of needing answers is present and the events of now bring this into the present and so begins a second journey. In visual contrast Pedro Almodóvar has used the iconography of modern art to frame opening worlds. Bea’s mother has a collection of modern art which would satisfy the most voracious magpies of modernity, providing a tableau of conservative sophistication. In the hallway is a thin long black table with a line of Giacometti like (1cm?) tiny black figures lined up like the Easter island states of men guarding the citadel that is her apartment. Bea (Michelle Jenner) herself becomes a part of the style council and her clothes are spectacularly sublte in expressing a conviction to style. Julieta (Emma Suárez) brings some of the sensibility unearthed in her relationship with Ava (Inma Cuesta) into the transference or resettling in avoiding anything Antiá related to her surroundings. A Lucian Freud self portrait looms large and permissions pepper the credit roll for the ‘loan?’ Use of these images throughout the film, so vivid and vital, are in their presence creating distinctions internalised and externalised. It’s not just a Spanish thing! The film has moral tales throughout on the fine lines of communication, of the effect of unwanted interventions and worst of all, the inescapable passage of tragedy as part of life’s course in unchangeable ways. It is a masterful film. On at QFT BELFAST from 26 August through to and including 8 September 2016.